This is lesson 1 of 42. This series is currently in-progress and will have new lessons each week, visit Bethany’s author page to see the latest available. Bibles, a large piece of paper with the word ALMIGHTY written on it, key verse (Isaiah 14:27) printed on a piece of paper, blank paper and markers or colored pencils for each child in the group. Optional: Download our free coloring page for A is for Almighty. Take a few minutes to introduce this new study and explain that each time you meet together you’ll be looking into the Bible to discover a different truth about who God is and what He is like. Start out the teaching time by reading the first part of Genesis 18:14 (Is anything to hard for the Lord?). Ask the kids how they would answer that question. Have them name some things that they know that God has done that would be too hard or even impossible for people. (With younger groups you may want to be prepared with answers to this question to share with them. Show the word “Almighty” on the poster and explain that this morning we’re talking about the truth that God is Almighty. Read Judges 7:1-8 as a group and have a few of the kids act out what you are reading while you are reading. Then, fill in the details in the story in your own words from Judges 6-7. Tell the kids that this story comes from the book of Judges and remind them that Judges was about the time period after God had led His people into the promised land, but that during this time they stopped following God and God judged them for the sin and then when they would repent God would send a judge (or leader) to rescue them, and that Gideon was one of the judges that God sent to rule over His people. Include the following points in your review of the story…. Gideon gathered up 32,00 men of Israel to go out and fight the Midianties. (this is the section that was read and acted out) So God sent them down to the river to get a drink and He told Gideon to chose the men who lapped up water from the river like a dog….this was only 300 men. God told Gideon that He would win the battle for them with only these 300 men. Read Judges 7:15-25 – So God won the battle for them with only 300 men. They could see that they won only because God is all powerful….or ALMIGHTY. Since motions & actions help kids remember, choose an action for ALMIGHTY. A good motion might be to make strong arms (flexing muscles). (3) How did God give the people the city of Jericho? To help solidify this truth in the minds of the kids in your group, read these passages together – or have kids taking turns reading a passage to the group. Genesis 1:1-5, Genesis 7:17-8:1, Genesis 21:1-7, Exodus 14:21-31, Job 38:4-24, Matthew 8:23-27, John 11:25-44. 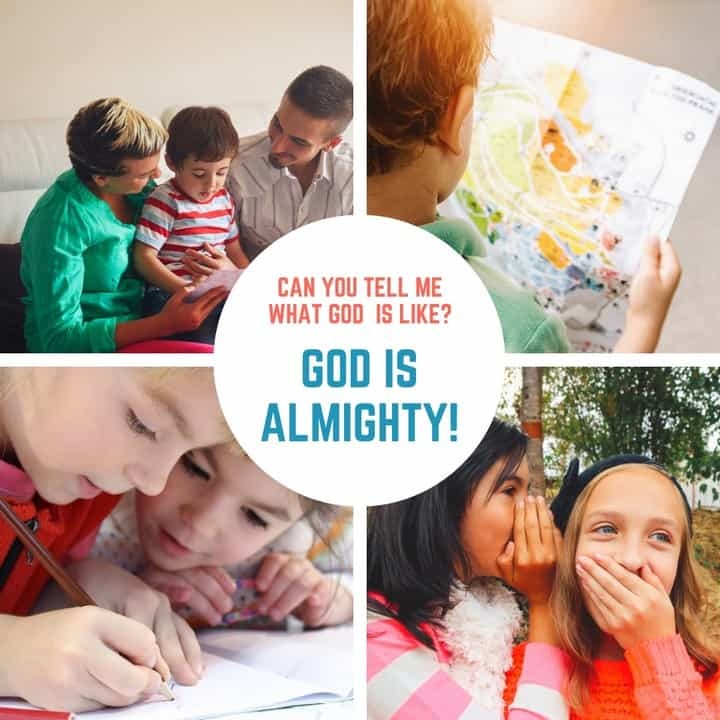 After each passage, have one of the kids explain how that passage teaches us that God is almighty. Ask what does God do in this passage to show His power? Read the memory verse (Isaiah 14:27) off the poster a couple of times and have the kids do the motion for the word almighty. Help the kids to make the connection between God being almighty and the work that Jesus did on the cross. Explain (or remind the kids) that God saved the Israelites with only 300 men to show His power and to make sure that the Israelites knew that salvation was through God alone. God wanted to make sure that no one could boast in their own strength or think that they had fought the battle on their own. The same is true for us when we think about salvation. Ephesians 2:8 tells us that salvation is a gift from God because of His grace, not something that we can do on our own. The only way we can be saved is to be like Gideon and trust in God’s plan to save us through the death of Jesus in our place. Give each child a blank piece of paper provide markers or colored pencils. Encourage them to write the word almighty somewhere on the paper and then write or draw something to help them remember this attribute of God. They could write the definition for almighty or the memory verse or they could illustrate the verse or the story of Gideon or any of the other passages you read about God being almighty. After a few minutes, bring the group back together and give kids time to share what they have drawn or written. Praise the almighty God for the way we saw Him rescue His people in this morning’s story and ultimately for the way we see Him rescue His people through the death of Jesus. Filed Under: Judges, Lesson Plans, What is God Like?